Lectora Canada is a full-service eLearning company with state-of-the-art Learning Management System, Leading Authoring Tools, Canadian Hosting Centres, Content Development & Web Development Services and an expert team offering strategies for every organization. 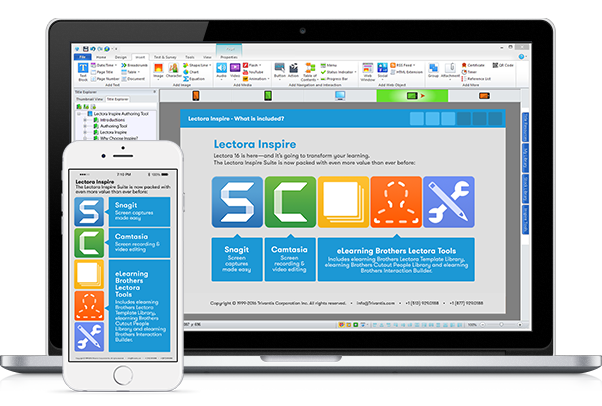 Lectora provides the tools necessary to create beautiful and engaging eLearning. Stay on the cutting edge with Lectora products from Lectora Canada. All of our Lectora products automatically receive updates to any new features. Lectora products are now easier than ever to use to create eLearning courses. Get started quickly with easy-to-use, intuitive tools to help you create amazing content. Use one of our pre-made Lectora templates or build a course from scratch, the possibilities are endless with Lectora products from Lectora Canada. Lectora Canada comprises of expert team instructional designers who design courses which transfer knowledge to your learners efficiently and effectively. Our instructional designers will work with you to define learning objectives and create the course you need for your organization. Unlimited access to all of the Trivantis products and services for one fixed price, eliminating any unexpected budget surprises in the future. From quick templates with pizzazz to full course development, Lectora Canada will work with you to meet your e-learning needs. Lectora Canada offers LMS systems in partnership with Trivantis. CourseMill is a highly malleable hosted system that can be fully customized to satisfy any corporate requirements. Lectora Canada is a full service eLearning company with state-of-the-art Learning Management Systems, Content Development tools and an expert team offering eLearning strategies and content development services for every organization. Lectora Canada is a full-service eLearning company with state-of-the-art Learning Management Systems, Content Development tools, and an expert team offering eLearning strategies and content development services for every organization.